The PORCELANOSA Grupo Architecture and Interior Design Awards are here once again, challenging the design laws and boosting architectural creativity. It is an event which, year after year, is a challenge for both students and professionals, not only because of the chance for them to work together with a renowned firm like the PORCELANOSA Grupo, but also to surpass themselves through the creation of innovative unique projects. At this 10th edition, the challenge involves the creation of a Work Studio or work space for the Professionals and Students Forward-looking projects’ category. The contestants will not be provided with any plans, so that they can let their creativity flow when taking on the project. The surface can range from 250m2 to 500m2 and the project can be divided into several floors. Additionally, the design can also be anything from a real or an invented space restoration to an innovative and new creation project. In this regard, even though the Work Studio arrangement and shape depend on the contestants’ creativity and imagination, the minimum room space that the design must be provided with are: an entrance hall with a small wardrobe or cloakroom; a common work area; a dining area with a built-in kitchen; documentation room; a meeting room; a recreational and resting area; and bathrooms. Furthermore, other spaces can also be designed, such as the building façade, the offices, the terrace or the furniture; with the aim of providing the jury members with a better understanding of the project. As with every year, it is worth highlighting that PORCELANOSA Grupo’s requirements are the use of the materials and products from the eight firms from the Group for the project design. Hence, the contestants will benefit from the most innovative designs regarding ceramic floor tiles and wall tiles, natural materials, kitchen and bathroom equipment and building systems, as well as the avant-garde ventilated façade systems by Butech. The KRION® Solid Surfacemineral compact may also be used as the thermocurving material capable of a design reinvention and with an incomparable purity. The contestants have a license to innovate, by always making use of the materials from the PORCELANOSA Grupo but without altering the product itself. The united concept of the project, the space consistency in the design, the adaptation of the interior design to the reason for doing the project, and the original use of the different materials from the PORCELANOSA Grupo will be an advantage. Furthermore, how the furniture and lighting have been built in and how the project is presented as well as its concept and development will be also valued. As an additional part to the required documentation, both in the Professionals and Students Forward-looking Projects categories, a written report justifying the entry, objectives and the reasons for the interior design solutions taken, must all be attached. Beforehand, the registration on the webpage of the event must be made by filling in a form for each project. The project must be handed in in computerised form. The project delivery will be carried out virtually, by using the link and password provided in the registration together with the reference number. The folder containing the applications will be displayed before March 27th, 2017. 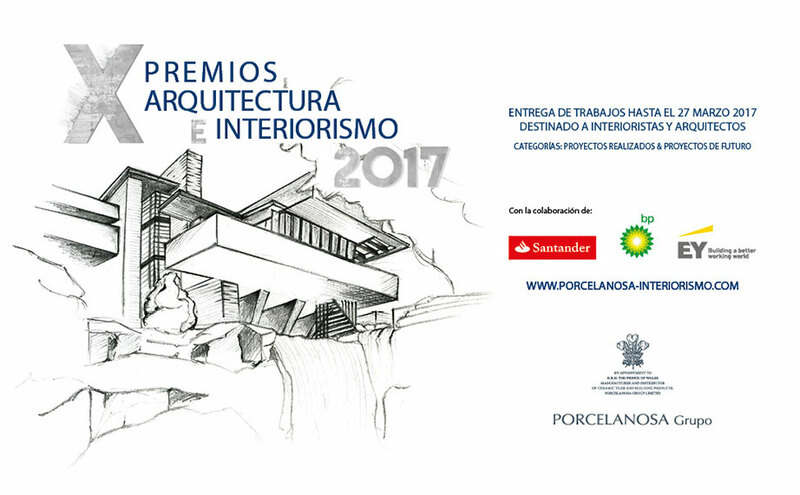 For further information regarding the submission of applications, please consult the website for the 10th PORCELANOSA Grupo Architecture and Interior Design Awards.